New YORK, N.Y. — Join New York Jets Wide Receiver, Eric Decker, along with with New York Giants Offensive Tackle, Justin Pugh, at the Citi Draft Night Watch Party on the first night of the NFL draft. Source: Procamps. 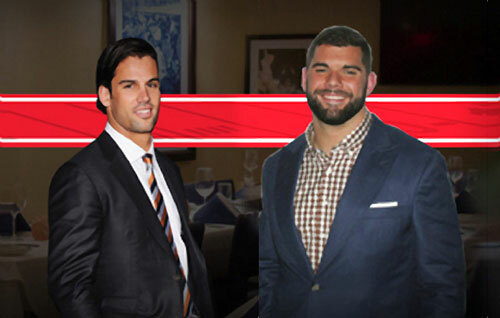 Citi cardmembers have the exclusive opportunity to purchase registration to a private viewing party for the first night of the 2015 Draft with Justin Pugh and Eric Decker! This intimate experience is exclusive to Citi cardmembers and otherwise closed to the public. Click here to purchase the Citi Draft Watch Party. Guests will enjoy light food and complimentary beverages while Eric Decker and Justin Pugh offer their insight on the draft and upcoming season. Guests will also have the opportunity to participate in an interactive question & answer period with Eric Decker and Justin Pugh. Guests must be at least 21 years old. Watch New York Jets wide receiver Eric Decker speaking with with Jeane Coakley on SNY’s Jets Nation in June 2014 where he talks about the upcoming season and shares his thoughts on playing for head coach Rex Ryan. Eric Decker is an NFL wide receiver for the New York Jets. Decker was drafted by the Denver Broncos in the third round of the 2010 NFL Draft. On March 12, 2014, Decker signed a five-year $36.25 million contract with the Jets. During this season he scored 5 touchdown receptions. In week 17, he had the best game of his career. Justin David Pugh is an NFL offensive tackle for the New York Giants. He played college football for Syracuse University. Pugh was drafted by the Giants in the first round of the 2013 NFL Draft. Sports Speakers 360 is a booking agent for pro athletes. If you would like to book Eric Decker for a speaking engagement, appearance or endorsement, contact Eric Decker’s booking agent for fees at 1.855.303.5450.